Christmas Tree Ideas.net - Cool ideas for decorating your Christmas tree from the traditional to the unusual and everything in between. If you’re hankering after a London themed Christmas tree you could add some of the festive London Christmas ornaments that are around like the London Taxi Cab, Big Ben, Red Double Decker bus etc or you could go for a more original take on a London themed tree …. I have five ideas for right proper London themed Christmas tree that won’t look like a tourist attraction! While some of these ideas would suit a British style tree one of them is a classic London idea that most people wouldn’t even think about! London is home to the Pearly Kings and Queens … the tradition of sewing buttons onto their clothes was started in the late 1800s when a man wanted to raise money for charity. The Pearly Kings and Queens can be found on a regular basis collecting money for charities and you can find out when and where at Pearly Kings & Queens Society Events Page. To add a ‘Pearly’ touch to your tree simply get a selection of white buttons and string them together on some thread/ribbon/wool to make a garland that you can use instead of tinsel on your tree. The English are known for their love of dogs, but some seem more representative than others… the British Bulldog is synonymous with England so a bulldog Christmas ornament like the one below would be a great idea, then again you could also have a gorgeous Old English Sheepdog Christmas ornament as well or if you want to add a regal element a corgi ornament may look nice. Before you can say ‘Cor Blimey, that’s a cracker of a tree.’ you’ve got a very lovely London inspired Christmas tree, if you wanted more ideas then I do have a post on London Christmas Ornaments that you might enjoy. Combining ideas on both posts could give you a charming tree these holidays. This entry was posted in Uncategorized and tagged london christmas ornaments on August 21, 2018 by Lou. Let’s look at how to decorate your Christmas tree with a London theme this year. We can use ornaments that represent London’s icons along with other cool ornaments that represent different parts of old London Town. There are so many different things that represent London that if you want to just add a single ornament to a tree you might find it hard to know whether to go for Big Ben, beefeaters, red buses or something entirely different. Luckily for people who can’t decide (and actually don’t want a whole London themed tree) then we have some London Combo Christmas ornaments for you – I call them this because they combine a few different London elements into one ornament. Big Ben is one of the widely recognized symbols of London, much like we recognize the Eiffel Tower as belonging to Paris and the Sydney Opera House belonging to Sydney when we see a picture of Big Ben we instantly think of London. What better image is there to hang on a London inspired Christmas tree than this big clock tower that was built during the 1850s and is the largest four faced chiming clock in the world. When you visit London you are actually obligated to take a photo with Big Ben … well okay I just made that up, but most people do! Beefeaters are an iconic sight in London where they were originally tasked with safeguarding the Tower of London and in particular the Crown Jewels. Their official name is the Yeoman Warders and they were formed way back in 1485 by the first Tudor King of England – Henry VII. These days Beefeaters act as a tourist guide and are regularly photographed by tourists to London. As I said above the Beefeaters were originally tasked with the job of guarding the Tower of London which is now a tourist attraction in London, partly for people who want to see the Crown Jewels and partly by people who want to know about the Tower’s long, dark history. London’s Tower Bridge, not to be confused with London Bridge, is another iconic sight in London and I just loved watching the bridge open up whenever I visited London as a child. It seemed so big and imposing that I wondered how it managed to open up so easily to allow ships to pass through. How could you have a London inspired tree and not include at least one ornament of the Tower Bridge? Lots of people come to London in hopes of seeing the Royal family. When I was growing up Buckingham Palace wasn’t open to the public, but now it’s a popular destination to visit. What was (back when I was living in the UK) and still continues to be a popular event for people to watch is the Changing of the Guard. The Queen’s Guard is definitely another icon of London and makes a pretty cute looking Christmas ornament as well. The red telephone box is an iconic image of the UK and so has really earned it’s place on your ‘London’s Calling’ Christmas tree. Although red double decker buses are seen around Britain, in fact I used to take one to college every day in Dorset when I was younger, they are also seen as an icon of London along with the black taxi cabs. I must admit that when I returned to England after living overseas for 9 years it was the sight of a red double decker bus from the airplane as we were circling that tugged at my heart and made me excited to be back! A relatively new attraction to London (in terms of London’s history that is) is the London Eye which opened it’s doors in 2000. Despite only being around in this millennium the London Eye has quickly made it’s mark as a recognizable London attraction which is why it’s also available as a cool Christmas ornament. London has been around as a settlement since Roman times when the very first London Bridge was built (mere yards away from the modern London Bridge sight). This means that there are lots of old buildings and historical sights which represent London and here are a few vintage images of them. Buildings such as St Paul’s Cathedral, The Royal Mint, The Old Bailey etc. This entry was posted in Uncategorized on August 21, 2018 by Lou. Buy Frank Sinatra Christmas Ornaments here! Having arguments about what theme your Christmas tree is going to have this year? Just say we’re going to do it My Way and decorate your tree with Frank Sinatra, the chairman of the board himself! There are some awesome Frank Sinatra Christmas ornaments to choose from so let’s have a look at some of them. The first one that I’m going to feature is my favorite one which shows him in his prime as that very dapper gentleman that he was. Hang Ol’ Blue Eyes on Your Christmas Tree! What makes this one my favorite? There are lots of different Frank Sinatra Christmas ornaments to choose from, but my favorite one has to be this cool 2011 collectible Frank Sinatra ornament (shown above). I really like this one as it shows Frank off in his very best 1950s fashion and also adds a sense of the Holiday spirit with the snowflakes behind him and, of course, the hoards of gifts under his arm. This particular Christmas ornament is also musical, when you press the button on the rear of the base you can hear Frank singing part of his iconic song – “Have Yourself a Very Merry Christmas” – does it get much better? Frank Sinatra Christmas ornaments are a great gift idea for anyone who loves the sultry tones of Frank Sinatra, an original member of the Rat Pack. If you love the original Ol’ Blue Eyes yourself then you are going to love these Sinatra Christmas ornaments, there’s only one problem – which one to choose! Frank Sinatra really was a legend and these Christmas ornaments do their best to capture him at the height of his success. Even though Frank Sinatra died in 1998 he still has a legion of fans around the world, in keeping with Christmas Frank even released Christmas albums so you can listen to his crooning while hanging an ornament or two on your Christmas tree this year. For a few years Carlton Heirloom ornaments in conjunction with the Sinatra family were bringing out a Christmas ornament for fans to add to their trees during the holiday season. Of course some fans actually have an ornament tree on display all year round dedicated to the smooth crooner. I also know that some of these ornaments aren’t even put on a Christmas tree but are placed as a centerpiece on a table which is a lovely idea. I think it’s quite appropriate to have a Sinatra ornament on the tree at Christmas because listening to him singing Christmas songs is definitely a nice way to enjoy an evening or two – in fact popping on one of his Christmas albums before decorating the tree is a lovely tradition that you should try and start (if you don’t already do this that is). Of course you can also add a few other things to your tree besides these Sinatra ornaments, the first two songs I think of when I think of the old crooner is My Way and New York, New York so obviously if it was me I’d be adding a few New York Christmas ornaments to the tree. I love the idea of a couple of old fashioned television ornaments, record player ornaments and retro microphone ornaments filling out the tree as well. What other things would you like to add to a Sinatra tree? This entry was posted in Uncategorized and tagged celebrity christmas ornaments, frank sinatra christmas ornaments, musical christmas ornaments, new york christmas ornaments on April 30, 2018 by Lou. Let’s look at creating a zombie Christmas tree whether it’s a ‘regular’ zombie tree or a Walking Dead Christmas tree. Zombies have been a hot theme for a few years now and there’s no sign of their appeal slowing down. When creating a zombie Christmas tree you have to think of the tree itself as well as the decorations and there’s certainly a lot of different ways to go about it. The first decision is whether you’re going to use a ‘real’ tree or an artificial tree, once that’s decided we can move on to the rest. If you’re going to go with a real tree then you really don’t want it looking too healthy, we’re talking about a tree dedicated to the undead so this is the year to get the straggly looking tree that no one else wants – it’ll look awesome! If you’re getting an artificial tree I would seriously consider a black Christmas tree as it just has the right undertones for what is essentially a horror themed Christmas tree. If it’s a black tree you can go with a lush look as it’s embracing the dark side well and truly. Now along with the assorted zombie inspired tree decorations that you can find I would also look at adding a few body parts……….wait, I don’t mean chopping peoples ears or feet off! You can get some Halloween decorations in the sale and repurpose the (fake) body parts adding a couple to the bottom of the Christmas tree just sort of hanging off the bottom branches or leaning up against the tree as though a zombie had brushed past and left it hanging there. If you’re really lucky you’ll be able to pick up a string of entrails which you can drape over the tree in place of a garland or tinsel. Anyway you get the idea and now for the ornaments…. Here’s a few cool zombie Christmas ornaments from Amazon…..
For some more unique zombie Christmas ornaments you should definitely check out Etsy as you can often find some gorgeous ornaments on any theme there. Here’s a few of the zombie ornaments available…..
Alternatively grab out an old Christmas tree skirt and rub a little dirt into it before flicking fake blood onto it to make it look like a ‘zombified’ tree skirt. You create a Walking Dead Christmas tree much the same way as above when looking for the type of tree, but when looking for the ornaments we’re going to zone in on TWD as opposed to zombies in general. I would also be looking at getting one of TWD funko pop figures to put on the top of the tree, not quite sure how you’d fix it on, but I’m willing to bet it could be done quite easily. I’ve also just discovered that you can get TWD Christmas tree lights so I just have to share them here with you. Other things you can hang on the tree include Dale’s Winnebago (an ornament of a Winnebago that is, not an actual one! ), Darryl’s crossbow, an eye patch to represent the Govenor and as mentioned above under the more general zombie Christmas tree body parts are always a good look. You could even pop a TWD funko figure on top of the tree for a really cool look. If you can’t find a Lucille ornament to hang on the tree, but you have a replica on hand you could always rest it against the tree – that would look awesome! I hope that’s helped you with creating a zombie Christmas tree – I’d love to hear from you if you’ve tried this theme in the past and especially if you have any tips to share. This entry was posted in Uncategorized and tagged the walking dead christmas tree ornaments, twd christmas, zombie christmas, zombie christmas tree, zombie christmas tree ornaments, zombie ornaments on October 5, 2017 by Lou. If you’re looking for a cat Christmas tree ornament that is just right then you are going to love the selection I’ve found for you here. Whether you’re buying a cat ornament to adorn your own tree or whether you’re buying one as a gift there really are some rather mischievous looking cat ornaments available. As a former cat owner I have really fallen in love with a number of these ornaments, especially the ones that remind me of my late cat, Tiger who thought that the Christmas tree was there just for him! I know that when we used to decorate our Christmas tree our cat used to think we’d just created an indoor playground for him and would hit all of the Christmas ornaments off. I certainly can’t be the only cat owner who’s experienced this! Alternatively he’d lie on his back under the tree and reach up and pat the ornaments from one foot to the other……I used to live in dread of returning home to find him squashed under a toppled tree. Honestly I’m amazed my hair wasn’t prematurely grey! I sometimes wonder whether he would have left any cat Christmas ornaments alone or not, I mean cat’s are pretty smart I’m sure they would’ve appreciated a tree covered in cat ornaments. They probably would think it was there for us to worship at! It’s hard to choose just one from these three lovable cat ornaments, don’t you think? Let’s face it just one Cat ornament is often not enough which is why I’ve included some sets for you to enjoy looking at and imagine hanging on your own tree. 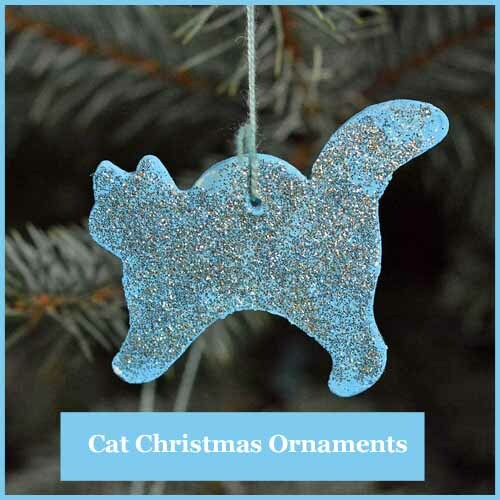 If you want to get a personalized cat Christmas tree ornament, then in my opinion you can’t go past Zazzle. You can order a range of different Christmas ornaments and simply upload your own photo of your cat and their name for a truly unique and personal ornament. This is a great ideas for special cats that are no longer with us. A DIY Cat Christmas Tree Ornament? 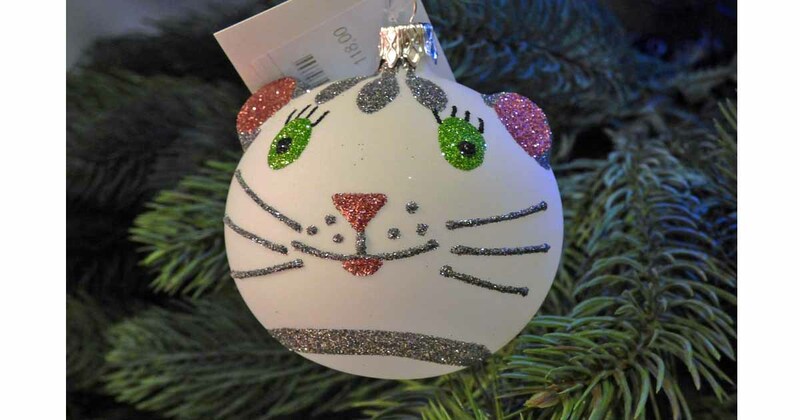 When I saw this cat Christmas ornament I fell in love with it, it also gave me an idea for a diy cat Christmas ornament. Now I’m not sure how to add ears to this ornament, but the cat face is certainly one that most of us could replicate. Arm yourself with a colored plain bauble ornament and a sharpie pen and you can create a very simple version of this ornament. Another version would be by using a glue stick to draw (I’d use a sharpie first and go other the lines with a glue stick, but this depends on your confidence levels) on to the bauble and then sprinkle glitter on. Another version would be to buy a clear glass bauble and paint it before doing one of the things above. There certainly are lots of ways to celebrate your feline friends over the festive holidays so why not have a cat themed tree this year? This entry was posted in Uncategorized on May 3, 2017 by Lou.